We have 500 banners for the concert! It says "SUNGMIN" at the top to grab his attention. The Korean says "There is nothing better than you", which is a line from the song "Good Person" and underneath it says the same thing in French. Beneath that it says "perMINent . net SMTown Paris 2011"
They are black with hot pink font, in order to draw his attention to the pink! You can make reservations by tweeting @DollChucky, so that she may add you and give you here phone number. Tomorrow morning, she will also be tweeting what she will be wearing so you can find her easily. She will be arriving to the venue around 6am and her friends Cyliane and Amélie will be distributing the banners. You can reserve 1 banner per person. The Hyuk2U banners will be passed out by the same group, but please do not think of these as souvenirs where you can take one of each. The point is to take the one you're more biased towards so that you can show him support! If you're picking up for friends as well, please pick up no more than 3 and provide names so we have proof that you're not just picking up for yourself. You do not have to tweet and reserve, you can just go pick one up, but we can not guarantee there will be any left by the time you get there or not! Any leftover will be passed to any ELF in the front of the stage. We will not ship any of these out, these are for concert attendees only. 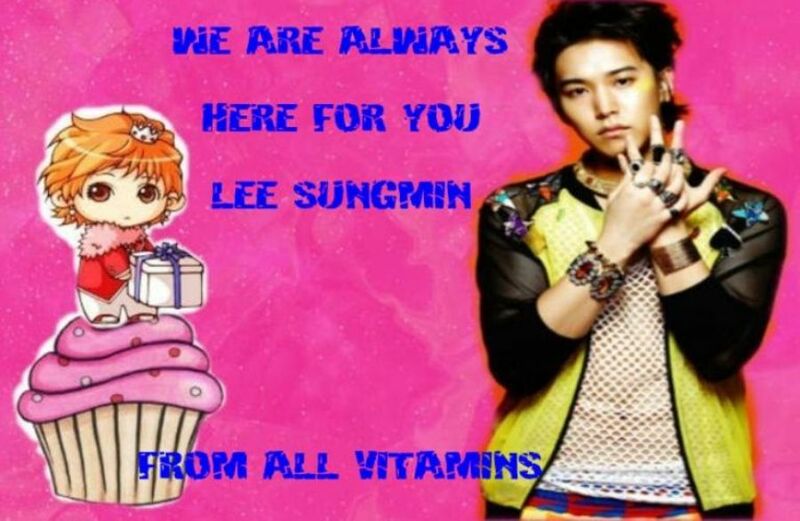 These are to show Sungmin that perMINent and all vitaMINs are with him wherever he goes! So its very important that when Sungmin is performing or near you, you hold up this banner to show him that! Keep in mind that Sungmin knows perMINent. He's held up our towels twice and sings, smiles, waves, and blows kisses to our girls every time he sees them. This may very well get you a smile you've dreamed of! So please do not waste it. We paid for these out of pocket with no donations, so its very important to us that they put to proper use. These will only be passed out on the first night, but we encourage you to take them back the second night if you're going to both. If you're only going to the second night, we apologize but we did not have enough banners made for both nights! If you have any questions about pick up, please tweet @DollChucky as the perMINent staff will not be at the event and can not help you. If you have any special moments with Sungmin at the event or you see him looking at the banner, tweet at us and let us know so we can share!